Sophie the Giraffe Activity Spiral is suitable from 3 months+. Pull, stretch and wrap around pushchair bar’s and cots, infact with it’s Velcro fastenings you can attach this spiral almost anywhere! Bright colours, varied designs and a range of different textures stimulate baby’s senses. Made with plush material for extra safety and softness for baby. 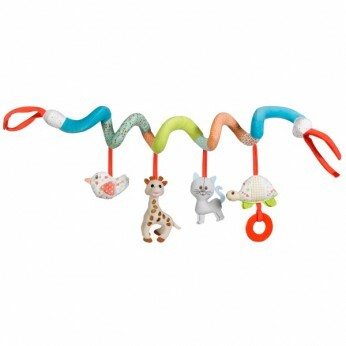 This toy costs approximately £16.99 (for the latest and best prices make sure you check our retailer list for the Sophie the Giraffe Activity Spiral above). In our review of Sophie the Giraffe Activity Spiral we classed it as being suitable for ages 0 to 11 months but recommend you check the manufacturer specific advice before purchasing.